Take a look at this these three incredible items from the 1992 Toronto Blue Jays World Series Champs. Each of these items is hand SIGNED by 25-26 Blue Jays players and coaches and EACH comes with it’s own certificate of authenticity from Toronto based Argus sports. All the signatures are bold and clear. Pat Borders has signed “MVP” after his name on each item. The signatures include the entire regular starting lineup, all the starting pitchers, all of the key relievers and the entire coaching staff. I have owned all of these since 1992. 1. The bat is a World Series Commemorative one and is numbered #443/1992. It is signed in black sharpie by the 26 players and coaches listed below. This does not mean there are 1992 signed bats, just that there were 1992 of this commenorative bat made. There are likely only A FEW that are also signed by the team! 2. The team photo measures 16″ x 20″ and is numbered #6/100. It is signed in black sharpie by 25 of the players and coaches listed below (no Stieb). It is a thicker photo paper rather than poster paper. 3. 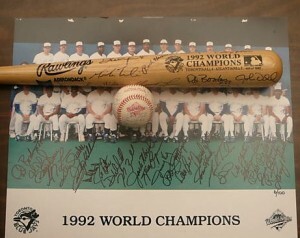 The Official 1992 World Series Baseball is signed in blue ball point pen by 25 of the players listed below (no Ward). These items are listed for $7,999 or best offer. Take a look at some more deals on vintage baseball bats and balls.